In the diagram above, the inner circle represents the Earth and the outer circle represents the celestial sphere. Point N represents the North Pole, B represents an observer’s position on the surface of the Earth, and U represents the geographical position of a celestial body (the point on the Earth’s surface immediately below the body). 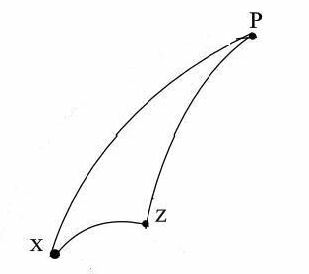 Points P, Z and X represent the projections of points N, B and U onto the imaginary celestial sphere. In astro navigation, the aim is to find the position of point B in relation to point U and N. The problem is that you would not be able to see the North Pole (point N) nor would you be able to see point U (the geographical position). However, you would be able to see the celestial bodies in the sky. So, although the spherical triangle NBU is inaccessible, you would be able to solve it, in effect, by solving the triangle PZX. 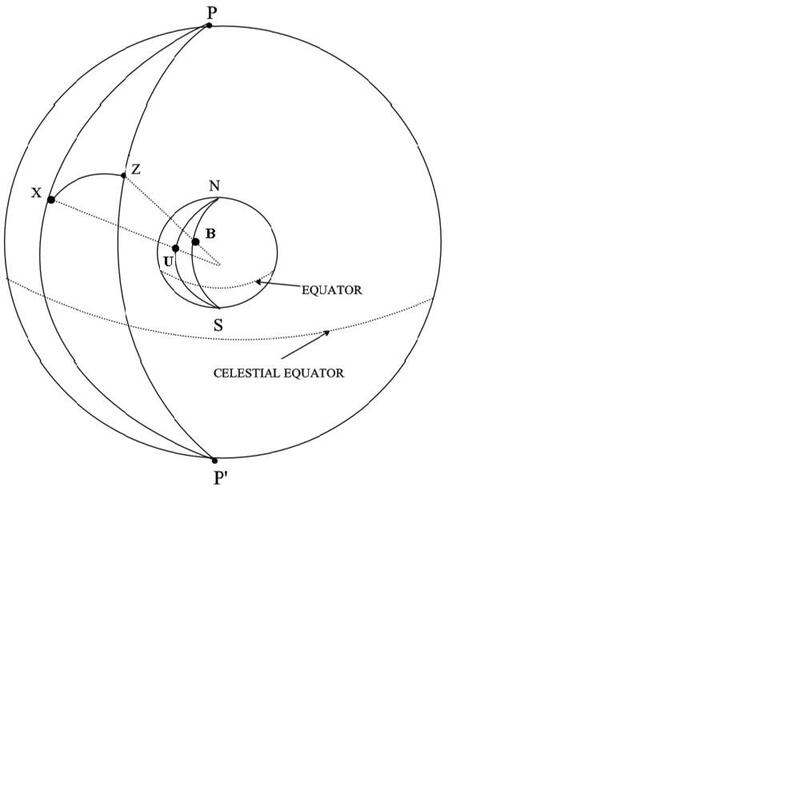 Unfortunately, things are not this simple because the celestial sphere and the surface of the Earth are curved and it follows that lines drawn on those surfaces must also be curved. Therefore, to solve the triangle PZX we must employ ‘spherical trigonometry’. 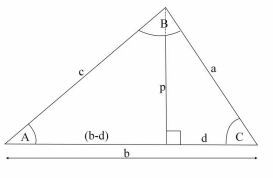 The mathematical solution of triangle PZX by spherical trigonometry is lengthy, complicated and gives scope for arithmetical error. Since time and accuracy are very important for the navigator, tables of computed altitude and azimuth (known as sight reduction tables) are available and these enable us to obtain solutions for all combinations of latitude, declination and hour angle. However, to fully understand the complexities of navigating on the surface of a sphere, it would be helpful to have a knowledge of ‘spherical trigonometry’ and for this reason, an exposition of the topic is offered in below. This is the cosine rule for ‘flat’ triangles but does this rule also apply to spherical triangles? The next diagram shows a spherical triangle ABC formed by the intersection of three circles with their common centre O at the centre of the sphere. The edges of the ‘flat’ planes in which the sides a, b, & c lie, meet along OA, OQ and OP. that is, AQ is the tangent to c and AP is the tangent to b. So angles OAQ and OAP are really right angles although it is impossible to draw them as such in the ‘flat’. 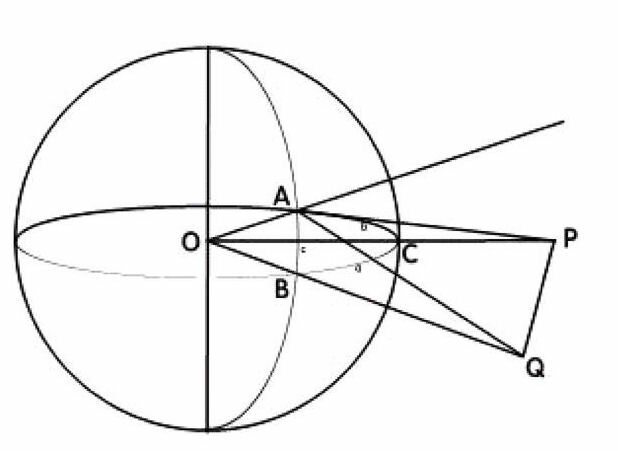 The edges of the three planes in which a, b, & c lie form a flat (two-dimensional) triangle PAQ, of which the apical angle PAQ is equivalent to the angle A of the spherical triangle. (This is the cosine rule for spherical triangles). Therefore Azimuth = N180oE (since the latitude of the approximate position is north). This entry was posted in Astro Navigation Topics, Schools and tagged amazon, astro navigation, astronomy, book, celestial, celestial navigation, celestial navigation for dummies. Bookmark the permalink.